Rob "Roy" Raindorf, born on the 13th of May 1949 in Accra, is definitely one of the most enigmatic artists to come out of Ghana. He appeared out of nowhere with a unique and twisted sound. An admirer of American artists Otis Redding, James Brown, Wilson Pickett and Ray Charles, Rob began his trade by learning the piano at a music school in Cotonou, Benin. When his education ended, he ventured out to make what money he could by getting gigs with the movers and shakers of the Beninese music scene, namely Orchestre Poly-Rythmo as well as the Black Santiagos. Absorbing and learning the intricacies of music composition, Rob returned to Ghana where he began to write his own songs and eventually sought the backing of a band, specifically one which possessed horns. 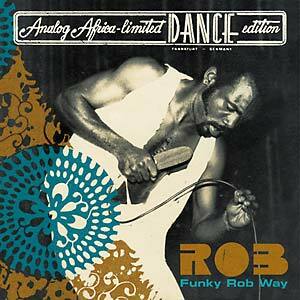 In 1977, a young Rob travelled to the city of Takoradi in western Ghana to approach an army band named Mag-2 whom he had seen perform in Accra. Mag-2 had an entire section of its ensemble dedicated to horns and some of the most sophisticated music equipment available in Ghana at the time -- Hofner guitars, Yamaha keyboards and the like. Belonging to the "magnificient" second battalion of the Takoradi-based army unit, original founder Amponsah Rockson decided to aptly-name the band "Mag-2." Mag-2 was essentially filled with the best elements of The Parrots, a highlife band in which Amponsah was the lead guitarist. 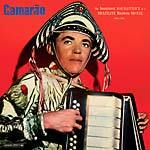 Their primary task was to entertain soldiers and with the army tour bus, perform from town to town as well as in reputable venues in the capital. 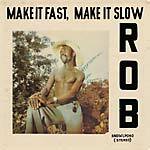 Enticed by the style of music Rob had proposed, Mag-2 backed the Ghanaian sensation on two of his most astonishing records -- his first and second albums -- Funky Rob Way and Make It Fast, Make It Slow, both of which were recorded at Essiebons studios in Accra. Despite Rob's training and musical education, Amponsah was responsible for the vast majority of the compositions, such as building the chord progression and arranging the horns that Rob craved. Rob would even wait for the Mag-2 maestro's cue to begin singing. Despite early successes, a once-unflinching interest in Afrobeat began to wane by the early 1980s and disco boogie rapidly became the vogue style around which label owners and music producers sought to capitalize upon. The style Rob had shaped his career around was in decline and an adequate income consequently became a major concern, forcing him to travel to Hamburg, Germany in search of a financial backer.